"Dry Docked lll" by Kyle Chaput. 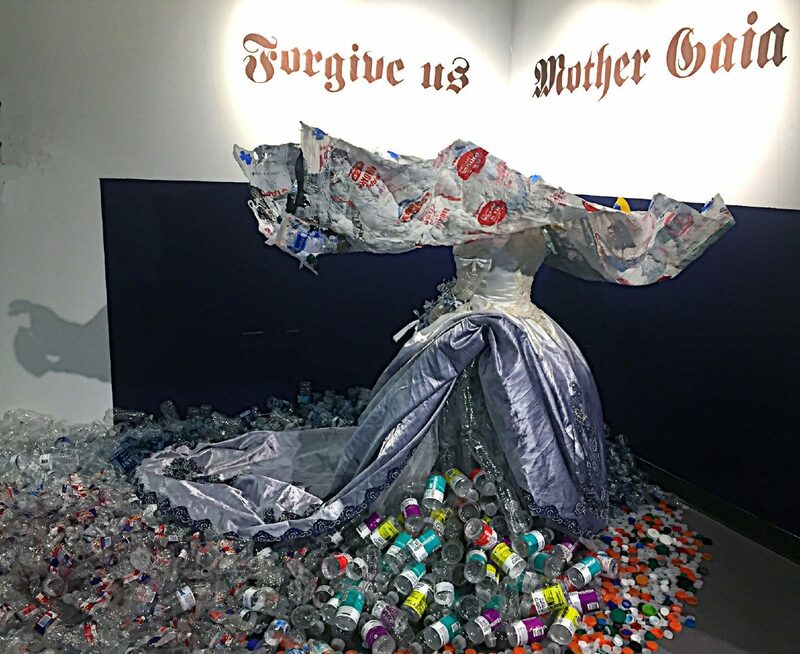 The South Texas college art faculty exhibition in the campus’ VAM Gallery boasts a stimulating range of approaches and provocative content. In it exists an eclectic mixture of styles that have the serendipitous result of broadening viewer appeal. A traditional painting of a mother with her children cohabits with a small vitrine encasing a 3-D printed object. Opposite an installation of banners protesting the border wall hangs a painting depicting sports violence. This exhibit caters to more than one specific niche. Most impactful from this show is the significance of the individual works. These are artists who not only have something to say, but have ingenious ways of saying it. Undoubtedly, the content of this exhibition is worthwhile. More so, most of the artists are experimenting with fresh ideas about the form into which their idea is communicated. Kyle Chaput’s woodcut is a standout in this category. 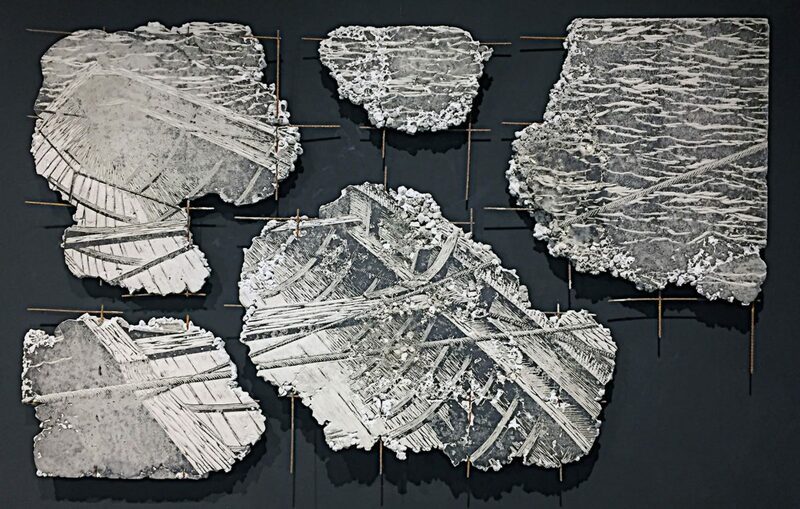 Printed on chunks of rebar-connected concrete, “Dry Docked lll” embeds the image onto a support that further reflects a possible broken condition. We are drawn into Chaput’s scenario. Also offering a unique experience is Tom Matthew’s column of sectional tree slices, “Progress (STC Lumber Company). He has reconfigured a tree that extends upwards to the height of the gallery. Although it gains height, it loses life. Trade-offs surround us in everyday life; we should pay attention. There are more faculty artists involved with social commentary than in the past and it’s certainly easy to understand why. "No al Muro/No Border Wall" by Rachael F. Brown. "Homage to Picasso's Guernica" by Eduardo J Garcia. "Progress (STC Lumber Company)" by Tom Matthews. Moving into the main gallery there are works speaking of localized issues as well as those looking at the bigger picture. 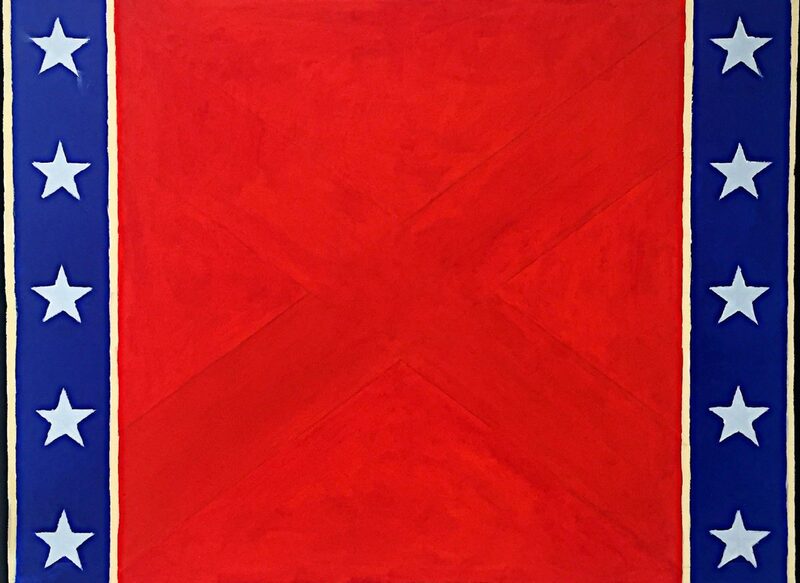 A painting by artist Richard Smith titled, “Reconstruction” shows the Confederate flag. The surprise is it’s depicted with the crossed bars shifted to separate verticals on opposite sides of the painting. “It’s Only History” is the title of Nathan England’s blue plastic covered sculpture that suggests an erstwhile statue. 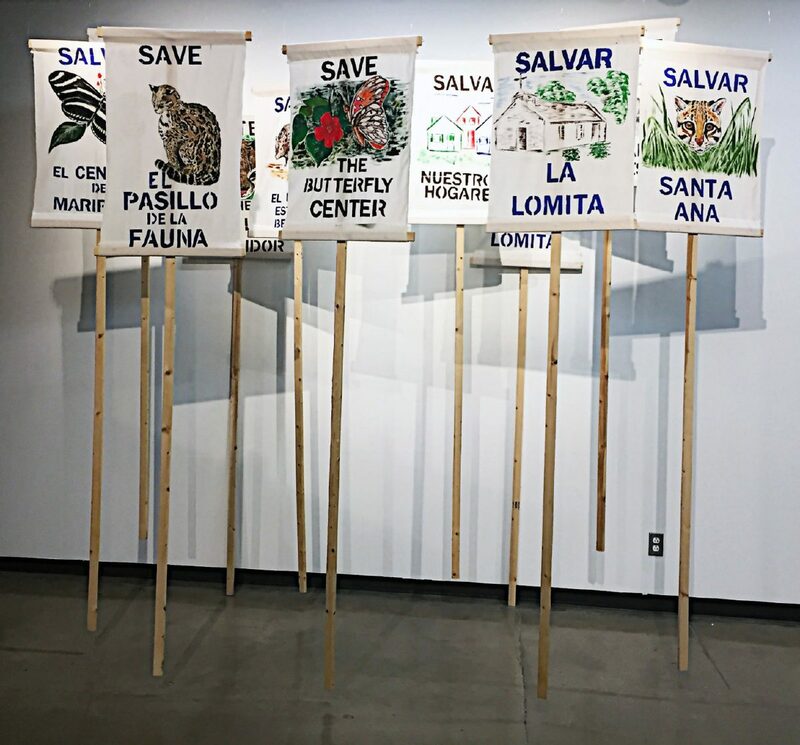 Rachael Brown keeps it relevant to South Texas with her installation of border wall protest signs and banners, while David Freeman takes on US immigration policy with his mixed media work. 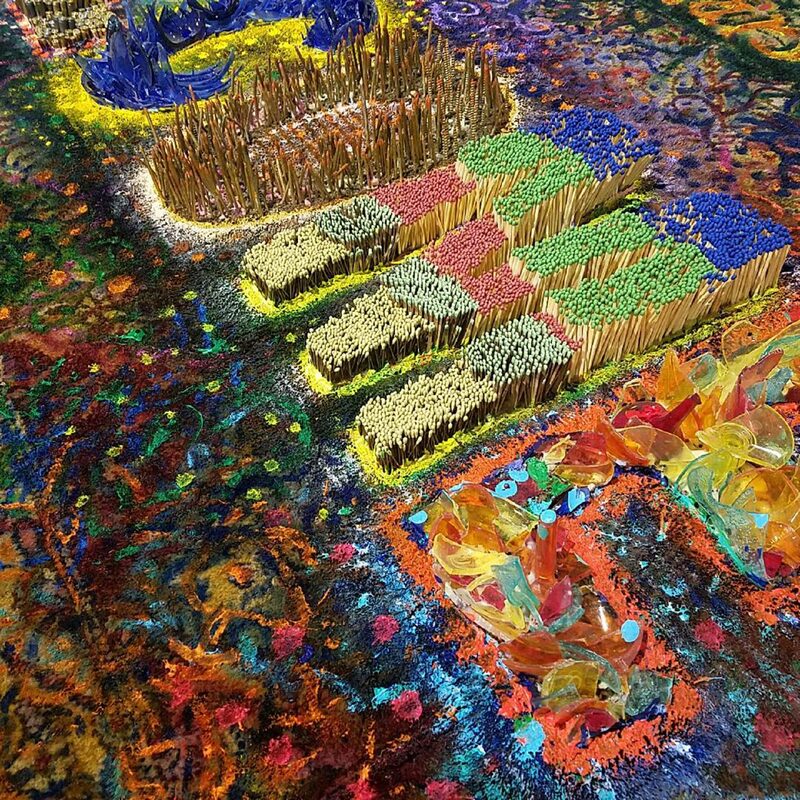 Spelling out “welcome” with incendiary objects, such as matches, bullets, and etc., Freeman places the conflicting message on an unwilling welcome mat by painting on an actual carpet. 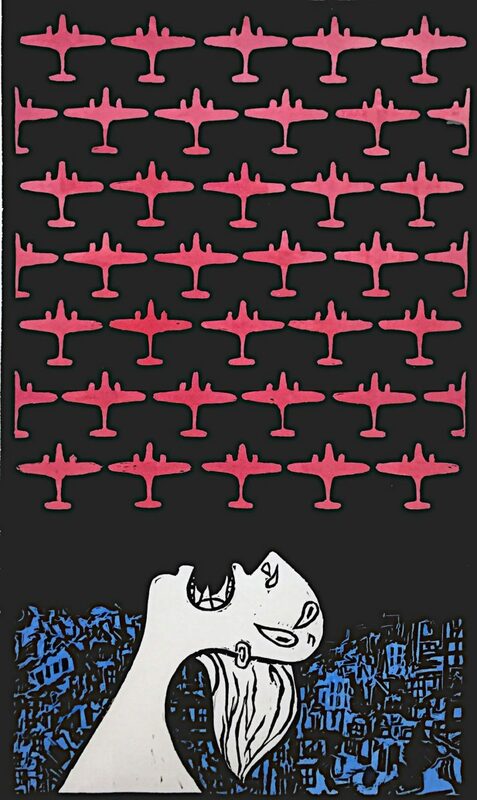 Eduardo Garcia continues placing his appropriations of famous paintings into current relevant concerns with his linocut print, “Homage to Picasso’s Guernica” complete with warplanes. Reading this exhibit a step at a time results in a jolt of aesthetic excitement from instructors who experiment and take chances with their own art. Other participating artists include: Maria Alcoser, Chris Leonard, Phyllis Leverich, Daniel McInnis, Heaven Mendoza, Isai Mireles, Scott Nicol, Juan Saenz, and Carl Vestweber. This exhibit has only a few dates remaining. And it’s a good one, so plan a long lunch break.